Using a large saucepan, melt one stick of butter over low heat. Add 1 chopped onion, and saute in butter until soft. Add lemon juice, vinegar, and worcestershire. Let it simmer on low as long as your ribs are cooking. This is the preferred method, but it takes more work. It takes lots of practice to master the pit, but if you know what you are doing, this is not too difficult. If you don't have a good heavy barbecue pit with a fire box, thermometer, and good quality oak lump charcoal (something like B & B Lump Charcoal), you might as well use the oven method, described below. The oven method still produces excellent results, but you wont get that smokey flavor that gives the ribs that extra je ne sais quoi. If you don't know how to handle your pit, or if you use that garbage charcoal you get at the grocery store, you can ruin the ribs with creosote (black, bitter, and burnt). Also, everyone with a barbecue pit has an opinion. If you have a strong opinion, then you probably have your own recipe. I'm going to describe the way I do it, and I have never had complaints or leftovers. Start with cool beef ribs. Turn the ribs upside down, remove the membrane to the best of your ability. Trim any excess fat from the ribs. 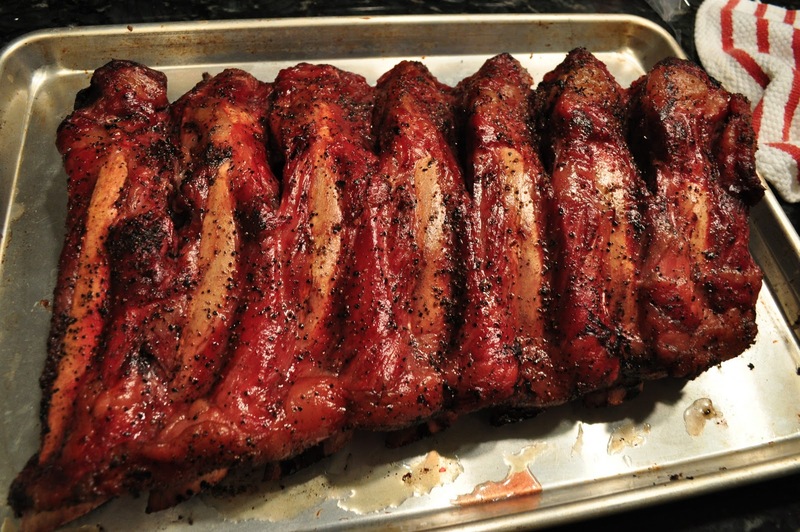 Pat the ribs down with a handful of paper towels so that they are moist, but not wet. Generously coat all sides of the ribs with course salt and pepper. 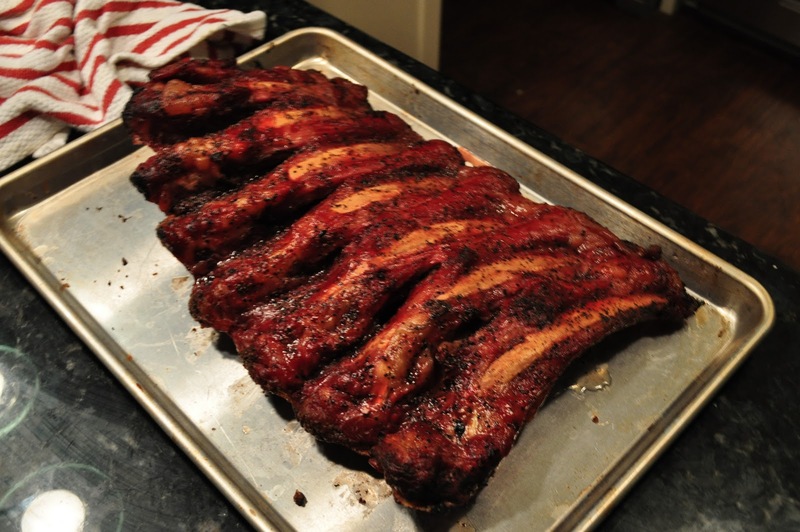 Let the ribs sit on a cookie sheet until they get to about room temperature. While the ribs are resting, you can begin to work on your fire. Soak about 10 - 15 lumps of charcoal with lighter fluid, and let them sit for a few minutes. Stack them in a pyramid in your fire box, then light them. The flame will get high as the fluid burns off, but will quickly subside leaving your charcoal burning at the edges. Open the air vent to allow plenty of air into the fire chamber. Let the lumps get completely hot - they may flame up again, which is ok. Let the second flame subside, then push the hot coals to the front of the fire box (the side of the fire box closest to the cooking chamber). Now fill the rest of the fire box with lump charcoal, and close your vent and smoke stack by 1/2. Shut the lid on the fire box and on the cooking chamber to let it heat up. What we are trying to produce here is a low and slow burn. The fire should stay at the front of the box. You push the unburned coals into the fire as necessary to keep the fire going and the temperature constant. You want the heat in the cooking chamber to reach 250 degrees, and stabilize. This gets easier the longer the fire is going, because the iron in the pit heats up which helps regulate the temperature. You want to adjust your vent and smoke stack so that a good deal of smoke stays in the pit, but you are letting enough air flow through the pit to keep the fire going. Once the heat has stabilized in the pit, place the ribs into the cooking chamber right side up, then close the lid. Don't leave the lid open for too long or you will lose your heat. Now start making your basting sauce. You don't need to baste the ribs for about 45 minutes, so you have plenty of time. I like to keep my basting sauce warm by leaving it on the warming tray above my fire box. After about 45 minutes, open the lid. Using a sauce mop, baste both sides of the ribs make being careful not to wash away the salt and pepper. Turn the ribs over, and close the lid. We will let this go for another 45 minutes before basting and turning again. Cook this way for about 4 1/2 hours. Finally, remove the ribs from the heat and let them rest on a clean cookie sheet covered loosely in foil for about 30 minutes. I find that cooking with this method requires no finishing sauce. The ribs are tasty, easy to eat, and the smoke-cured meat will keep for several days in a refrigerator if you happen to have leftovers. Basically the exact same as above without the charcoal. Bring your oven up to 250 degrees. Put the ribs directly onto the rack in the center of the oven (you can spray the rack with pam first if you want). If you have a convection oven great, but not necessary. Put a cookie sheet on the bottom rack to catch any drippings. I find the oven method does not require as much basting because the sealed oven keeps much of the moisture trapped inside. Baste when you feel it is necessary, but don't go crazy or you will make a mess in your oven. Cooking time is again, about 4 1/2 hours. Once done, remove the ribs and let them rest for about 30 minutes. This method will not work with pork ribs without some modification. Pork is naturally salty, so salting them up in this manner will produce a very salty end product. Brisket can be cooked this way, but the cooking time is much much longer. I usually cook my briskets for about 24 hours. I'll probably post a brisket recipe this Spring, so I can get some good pictures. Stay tuned!